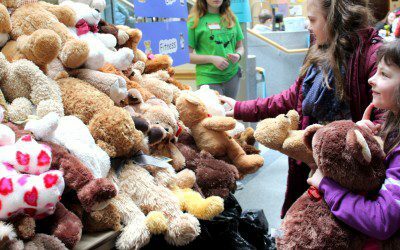 If you have a child with Type 1 diabetes and live in the Boston area, you may be interested in the upcoming “Teddy Bear Clinic,” hosted annually by the world-renowned Joslin Diabetes Center. On Saturday, March 19, from 10 AM to 12 PM, young children with Type 1 diabetes and their families are invited to learn about diabetes and healthy habits and to explore health-care experiences with a new teddy bear (donated by the Four Seasons Hotel) they select to take home. The children will begin at the “check-in” station, then make the rounds of various other health-care stations, recording the data they gather in their bear’s medical record. Activities include measuring the bear’s height and weighing the bear, taking its blood pressure, check its blood sugar and providing insulin if needed, giving it an eye exam, and taking it grocery shopping for healthy foods. The stations will be staffed by teenage Joslin patients and students from local colleges. The event will take place at Joslin Diabetes Center, One Joslin Place, Boston, in the first floor lobby area near the Beetham Eye Clinic and the atrium on the second floor. Those who are interested in attending the Teddy Bear Clinic are asked to RSVP by e-mailing [email protected] or calling (617) 309-4528 and leave a message indicating how many children and adults will be attending.